We are a family owned and operated business excited about getting guests out into nature. We moved to the Gorge eight years ago and fell in love the with breathtaking scenery and countless outdoor activities that happen in our backyard. Every day we experience the serenity, rejuvenation, and adventure of the Gorge and we would like to share that with you. 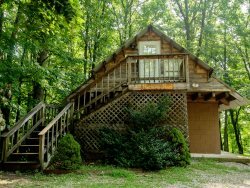 When you book a cabin with us, we hope to share with you our love and knowledge of this wonderful corner of Kentucky. We will do everything we can to make your stay in the Red River Gorge as enjoyable as possible. For questions or to make a reservation, call or text - 859 363 6091.